The Off-The-Top (OTT) feature is an exclusive DVO Suspension design. 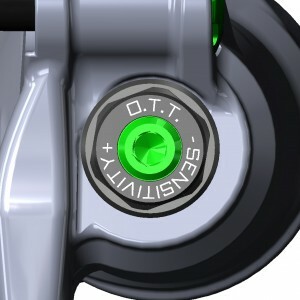 It allows the rider to adjust the initial sensitivity of the fork. Typically, a firm feeling fork (higher air pressure) will have poor or no small bump sensitivity. DVO has solved this problem with OTT. Now a firm set-up can also have amazing small bump sensitivity. This is accomplished by externally adjusting the preload on the negative springs. Increasing (rotate clockwise) the OTT will make the fork more sensitive (softer) at the beginning stroke. Decreasing (rotate counter-clockwise) the OTT will make the fork less sensitive (firmer). The OTT feature will not change the middle or ending stroke of your fork. YOU WILL NEED A 5MM ALLEN KEY TO ADJUST THE OTT FEATURE. MAKE SURE that you always adjust the OTT 1 full rotation at a time, not 1 click.